Holding onto memories before they slip away. With a colour palette that parallels with the season changes, artist Antonia Showering gathers memories together in the surface of her paintings. Antonia involves a great deal of skill in her layering process, and her technique is one of morphing recollections of family members, landscapes, and encounters on top of one another, juxtaposing her past experiences with memories that she believes may be true, dealing with both themes of reality and fantasy. The artist creates emotionally charged works that put the past on view into present representations, almost longing to “capture a truer description” of her recollections. 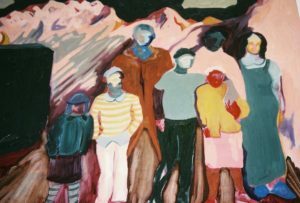 The artist’s strong interest in family and ancestry is linked to her mixed heritage background, finding “home” in the United Kingdom, Switzerland, and China. We recently visited Antonia’s studio and spoke with her about her use of paint, and the significance of understanding her own identity and heritage through her practice. Antonia Showering (b. 1991 London) holds a Foundation Diploma from Chelsea Art College, a first class bachelor of art in Fine Art from City and Guilds of London Art School, and is currently undertaking an MFA in painting at The Slade School of Fine Art. She has exhibited widely in the UK at Mother, London; Beers London; Slade School of Fine Arts, London; Unit 50 King’s Mall, London; Mall Galleries, London and Collyer Bristow Gallery, London amongst others. She has obtained the Chelsea Arts Club Award, 2017. Antonia is currently living and working in London. 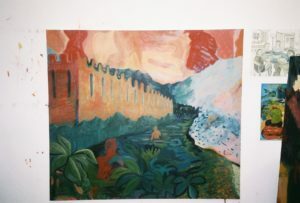 You undertook a Foundation course at Chelsea College of Art, Bachelor of Fine Art from City and Guilds of London Art School, and are currently doing an MFA in painting at The Slade School of Fine Art. What attracted you to specialise in the medium of painting? I really respect and engage with other mediums of art, but have always gravitated to using paint in my own practice. Paint has a huge history. Some parietal art [cave paintings] date back to 30,000 years ago- to join this long line of makers is awesome. I love being able to see the touch and decisions made by the artist with paint. There is temporality looking at 2-D images, as you can see the layers and how the hand has moved across the surface. I feel paint has its own language. You come from a multicultural background, mixed from British, Chinese, and Swiss roots. How does your culture clash and upbringing influence your work? I am quite sentimental and nostalgic, and so is my art. The word ‘nostalgia’ comes from the Greek word ‘nostos’ which means to find home. I wonder if this ties into my multicultural background? I definitely feel Chinese attributes have filtered down to me through the generations- my strong interest in family and ancestry for example. I use paint as a way of understanding my identity, and make sense of what it is to be of mixed heritage. 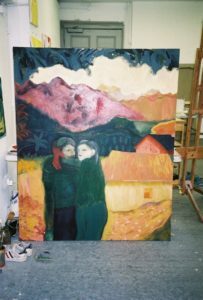 The landscapes are drawn from my memory of where I’m from in Switzerland, and the colour pallet is often warm, reddish light I believe to be found in The East. The people that inhabit these spaces are often my immediate family members. One of your brothers has a strong symbolism for you. He is a recurring character apparent in many of your pieces. Why do you choose to represent him on a recurring basis? I noticed this last year! My younger brother Keith seems to feature in 80% of my works. When depicting a person from memory I load many experiences and recollections of them on top of one another. This way, I feel, you can capture a truer description. I have known my younger brother the entirety of his life and so he is an easy motif to symbolise childhood and times past. Also… he never cares if he does or doesn’t get painted or if it looks at all like him! So the pressure of trying to please a viewer is removed. We have seen you work in different layers, adding up your experiences and erasing them to complete a new visual meaning to you. Could you expand on your painting process? Based on the nature of this working technique, are your paintings never fully finished? This way of working is called ‘Pentimento’. I like to heighten the emotional charge of a painting by stacking several memories on top of one another and then pulling back elements from previous layers to the final surface. I do think the paintings are fully finished at the end, because I stop layering when I feel satisfied both visually and emotionally. Your work derives from personal experience and memory – from a new-born family member to an experience with a past boyfriend – are your paintings a struggle to control your memories or modify them? My work is always very personal, I want the canvas to act as portal into my imagination and memory. 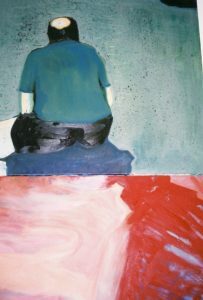 I use previous recollections as a starting point when approaching a painting. I see memory as one body, each memory morphs and adapts to new information learnt. With photography, acting a vehicle into the past, false memories can be created around an image. The fragility, and ephemeral nature of memory interests me a lot. I find through paint you can capture atmosphere and feeling. 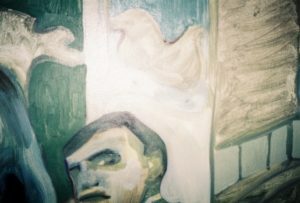 My paintings aim to hold onto recollections before they slip away, but in the process of doing so, some parts are exaggerated, others forgotten and therefore yes… they do get modified and altered. Your colour plays with tonalities – from cold qualities to very warm ones – creating a hybrid of eastern aesthetics with western ones. Why are you inclined in contrasting such pigments? Are certain colours meaningful to you? The tonality of my palette often parallels with the season changes. During winter the vibrant reds mute and then slowly return as spring arrives. I guess I choose the colours quite intuitively. I haven’t ascribed specific meanings to specific colours as there are so many variations within each- take. If we look at red for example; Camdium Red is so warm and brings things forward, but Alizarin Crimson is much cooler. There is a pallet I do feel safe with though; Burnt Sienna, Naples Yellow, Yellow Ochre and Phthalo Blue. You are currently drifting to a gentle palette, based in greys and greens. In contrast to your richly colourful pieces, why are you exploring muted tonalities? 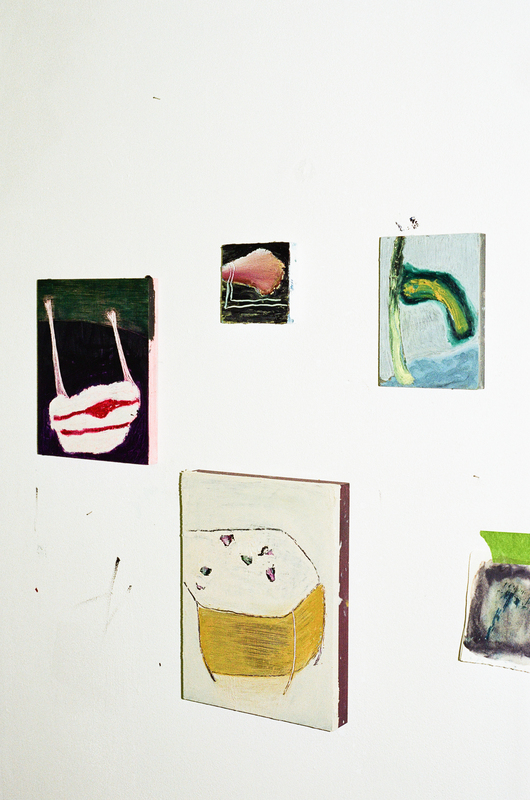 My recent works are more subdued in colour. The image appears to be fading, mimicking waning moments. I like to set up challenges for myself and by muting the colour I can focus on composition and atmosphere a lot more. I will reintroduce more colour, but maybe it won’t be until winter is over! We have read a very emotional ode you made to your dog, based on his death and your childhood memories. Is poetry part of your artistic approach? If so, how did you decide to start writing poems? I used to write those limericks all the time, that poem was from 2013! I loved Casper [the dog] so much, at one stage I thought he was my soul mate that should have been a human! 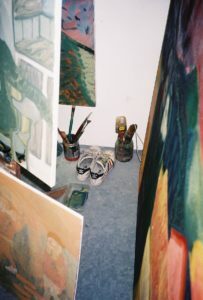 Both painting and poetry are ways of communicating. They have the ability to make abstract emotions tangible. I still enjoy reading poetry but don’t write so much anymore. You are currently participating in the group show “75 Works on Paper” at BEERS, London. Could you tell us more about the work on view there? I am really excited to be a part of this show. There are lots of artists also exhibiting whose work I had seen before and am pleased to have my painting ‘I’m Not Saying’ to be shown alongside them. The painting was made at the end of this summer during an intense relationship. It is of a man and woman sitting face to face, yet they feel quite disparate. I felt there was a lot happening in this piece so I extended the painting onto the frame. You are also part of an exhibition in relation to female Instagram artists, organised by The Great Women Artists, Katy Hessel. What does your work on view deal with? This painting is called ‘Take Me Back’. It is one of the only works I’ve done where the figures are not set in a specific location. I wanted it to be stripped back and not fall into a specific time frame- so it can be ubiquitous. It is of my family, from when my brothers and I were children. But nothing is overtly specific, as I want other people to project their own experiences of family and childhood onto it. It was done in an attempt to feel the freedom and lack of responsibility felt as a child. Slade’s final degree show is on the way. What works will you present? And why? Do you have any upcoming plans/projects you would like to share with us? In February 2018 I’m in an all women show at The Bloomsbury Hotel, I’m also in a show at Charlton Gallery in April 2018 which I’m looking forward to. I do think it’s important to focus on studio time whilst in the final year of a Masters, as the Slade is a very special place and my time here is going so quickly!